We may revise this policy from time to time. The current version will be posted at http://www.marsrhodos.ca/privacy. From time to time, photos may be taken at MARS events and at activities of its affiliated chapters. Members will be identified only by their first name, and only if desirable and appropriate. These photos may be posted in our newsletter and/or on the MARS Website and Facebook page for the public to view. The membership list will not be used for sharing non-garden related information. 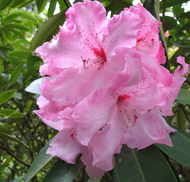 The disclosure of your personal contact information to the American Rhododendron Society in order to become a member of the ARS and receive the ARS Journal. You may withdraw consent and request removal of your personal information from our records at any time. However, this may affect our ability to provide you with membership benefits and services, especially as it relates to ARS benefits. MARS is responsible and accountable for personal information under its control and has designated a privacy officer who will attempt to resolve all concerns from members regarding the use of their personal information. MARS makes reasonable efforts to keep all personal information accurate and secure, and to permanently delete personal information that is no longer relevant. We may use a third-party plug-in to generate our website contact forms. We have no control over the third party’s operations and we are not affiliated with them beyond using their services to create our contact forms and we do not collect any data as a result of their use besides that which you knowingly enter. They may collect and/or process your data. We rely on their legitimate interests to process this data so that we can use your data as described under “Use of Personal Contact Information By MARS”. If you choose to join MARS, we will also register you for membership in The American Rhododendron Society (ARS) unless you tell us not to. To do so, we will provide your name, address, phone number, and email address to the ARS. Their policies are here.